You can quickly knit or crochet the center of this heart-shaped pin cushion for Valentine’s Day, using yarn from your leftover stash. In fact, it makes an ideal project for the beginning knitter or crocheter who wants to practice their craft and make something useful at the same time. Of course, you’re not limited to heart shapes – round, plastic coffee jar lids or similar containers will also work well for this pin cushion. You can add Valentine flair by gluing red and white ribbon, or other Valentine theme ribbon, around the outside of the lid. 1. Choose your container and measure the depth. 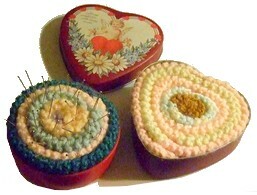 If you have a container with a lid, you will make the center to match this depth, as shown in our heart-shaped pin cushion. If the container has no lid, such as the coffee jar lid shown in our photo, you can make the center just a little deeper so that it sticks out just above the top of the lid. 2. Crochet a base chain, or cast on enough stitches, to make the knitted or crocheted piece to the depth that you will need. 3. If crocheting, single crochet across the base chain, turn, and repeat single crochet rows until you have enough length to roll into a circle that will generously fill your container. If knitting, knit plain rows to the desired length, then cast off. Your work, at this point, will look like a miniature scarf. Be a little generous with the length. Ideally, you will need to compress it a little to fit into the container so that the finished pin cushion is full and snug all around. 4. Do a test fit by rolling the knitted or crocheted piece into a circle and compressing it with your fingers to fit into your container. The circle should be full enough to expand into the arches of the heart shape when you remove your fingers. If you turn the jar lid or heart shaped box upside down, the center should be snug enough to stay in place and not fall out. 5. Remove the center and apply glue to the bottom and sides of the tin or lid. Replace the knitted or crocheted center as above, compressing it with your fingers to get it to fit. Push it down gently into the glue, making sure it is even across the top. 6. If desired, glue a length of Valentine ribbon around the outside of the jar lid, and add a few dress maker’s pins to the pin cushion.